In a recent post about the Beijing Olympics I wrote: "Instead of expending our energy debating a boycott, I say let's get creative." 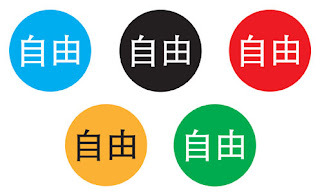 Reporters Without Borders would like all those planning to attend the Olympic Games in Beijing to wear a badge with the word “Freedom” in Chinese characters. The press freedom organisation has created a series of five badges in the colours of the Olympic rings for this purpose. The Paris-based organization is encouraging people everywhere to start wearing the badge -- whether or not they plan on attending the games.